This weekend Disneyland bid farewell to an important piece of its history. 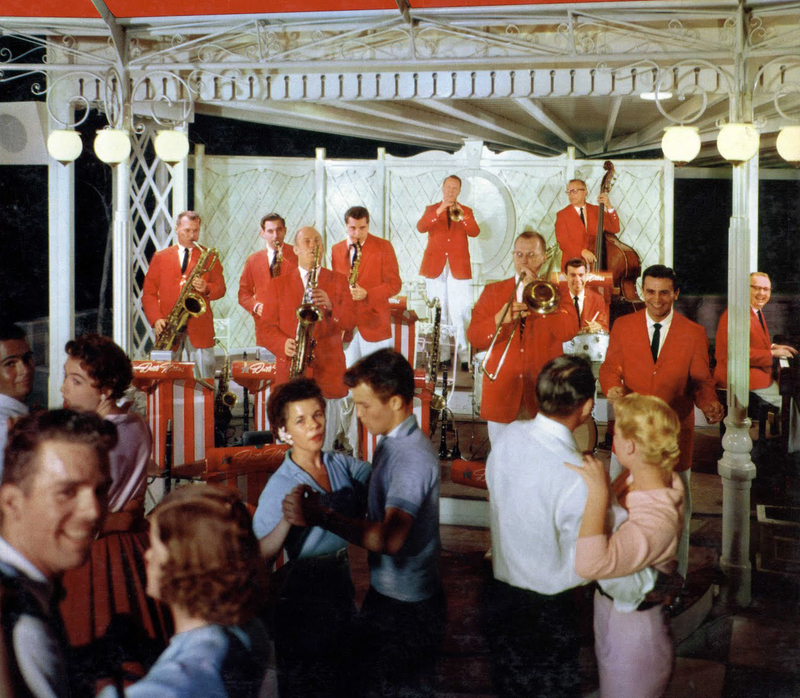 Since 1958, the popular red and white striped pavilion known as Carnation Plaza Gardens has been the place to go for live musical talent of all kinds. Summertime evenings at the Plaza, aglow with shimmering lights, felt like a "night on the town", with toddlers, teenagers, parents and grandparents whirling together on the dance floor. There are few spots like it in America today that can capture the same atmosphere for such a diverse and ever-changing audience. of the Elliott Brothers, were the star attraction during the early years. The roster of talent that came to Anaheim to perform on the Plaza stage over the years was impressive. Big bands and jazz giants such as Duke Ellington, Count Basie, Lionel Hampton, Gene Krupa, Louis Armstrong, and Tex Beneke performed here, as well as the legions of 'unkown' talent, school children, student choirs and performers. 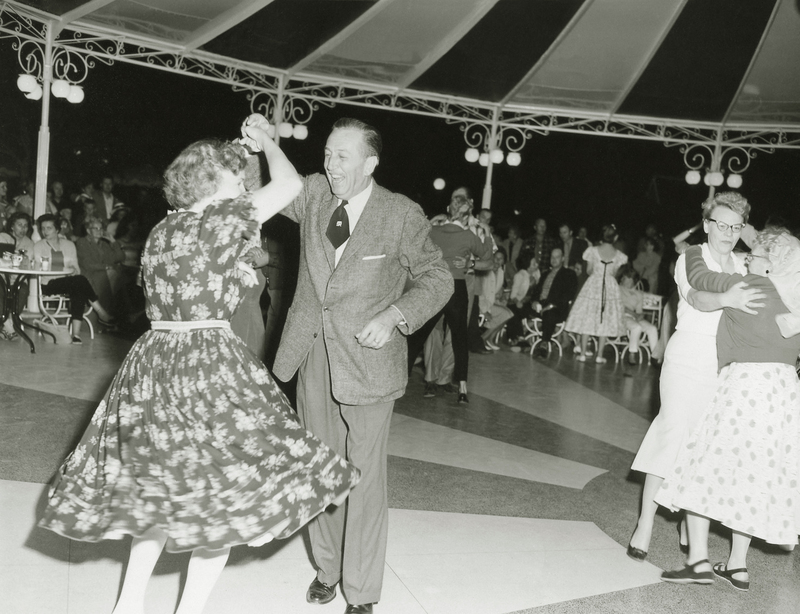 Everything from barbershop quartets to electric guitar have been heard in Plaza Gardens. This past Saturday night, April 28, 2012, the Plaza Garden pavilion was overflowing with nostalgia as throngs of people crossed the quaint footbridges, passed under the familiar arched sign, twinkling with lights, to savor a final dance beneath the red and white canopy. 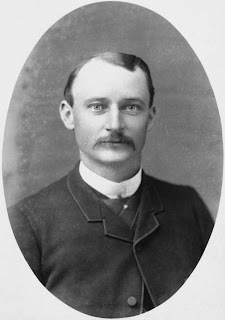 Do you recognize this gentleman? Perhaps not. This is Anaheim resident Samuel Kraemer, who dug up oil on his property in 1919 and became one of the richest men in Southern California. 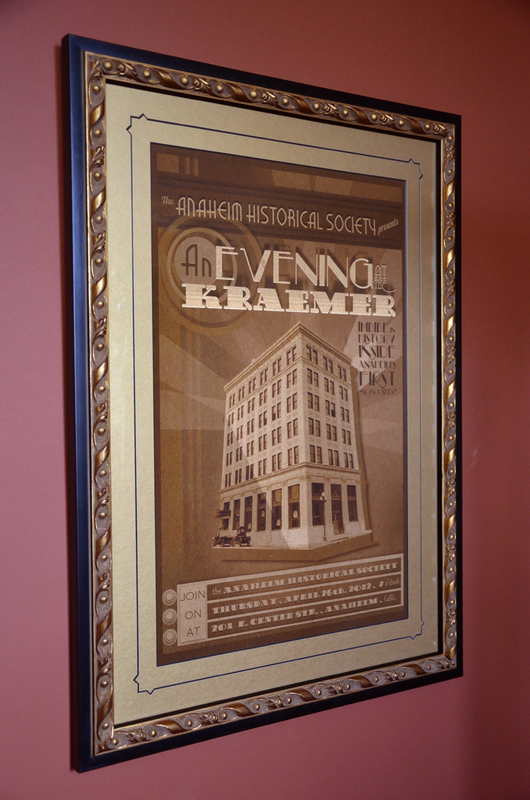 Kraemer invested his wealth in developing much of our downtown during the 1920s, including his six-story American Savings Bank of Anaheim --today known as the Kraemer Building. 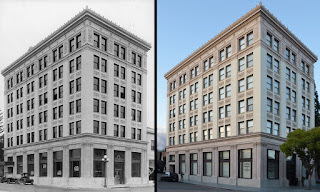 The Samuel Kraemer Building in 1925 and today. Designed by local architect M. Eugene Durfee, it was built at the same time that Charles C. Chapman was erecting his "skyscraper" in nearby Fullerton. When Kraemer heard that the Chapman building was going to be five stories, he had Durfee add an additional story and a penthouse so his building would be the tallest in Orange County. It remained so for over four decades! Now... brace yourself for a shock. Do you recognize the building in the photo below?? 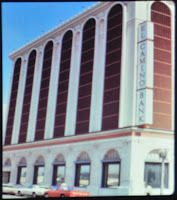 It's our very same Samuel Kraemer Building in 1976! Woah, what happened here? Well, in the 1970s old buildings such as the Kraemer were viewed as, well... old. 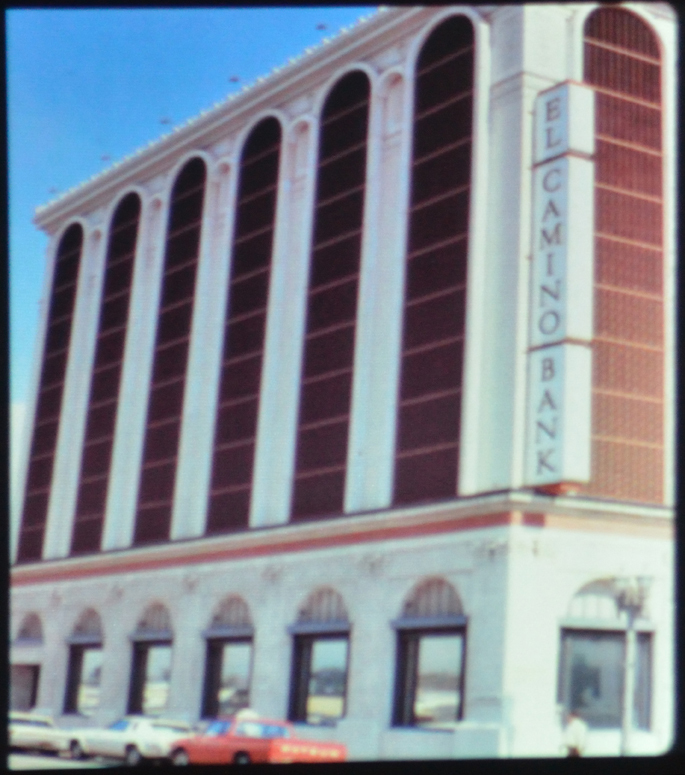 Anaheim's city leaders were redeveloping downtown, and though the Kraemer was spared the wrecking ball, the facade was covered with stucco and metal to give it a more 'attractive modern appearance.' If you need to stop reading for a moment and get yourself an Alka-Seltzer, go right ahead. We'll wait here for you. Alright! Flash forward to 2003, and the Kraemer building is meticulously restored to its original splendor by a team under the leadership of Preservation Architect Jim Wilson. The Kraemer Building's restorer, architect Jim Wilson (right) with Greg Gerovac of the Anaheim Historical Society. 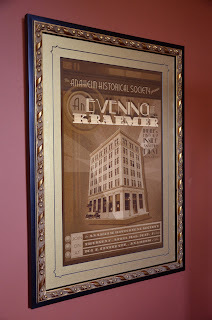 Last week, the Anaheim Historical Society presented "An Evening at the Kraemer" to celebrate the historical significance and distinctive character of our city's last example of the 1920s building boom. For AHS members, it was chance to view the Kraemer's restored grand lobby, with its opulent ceiling. 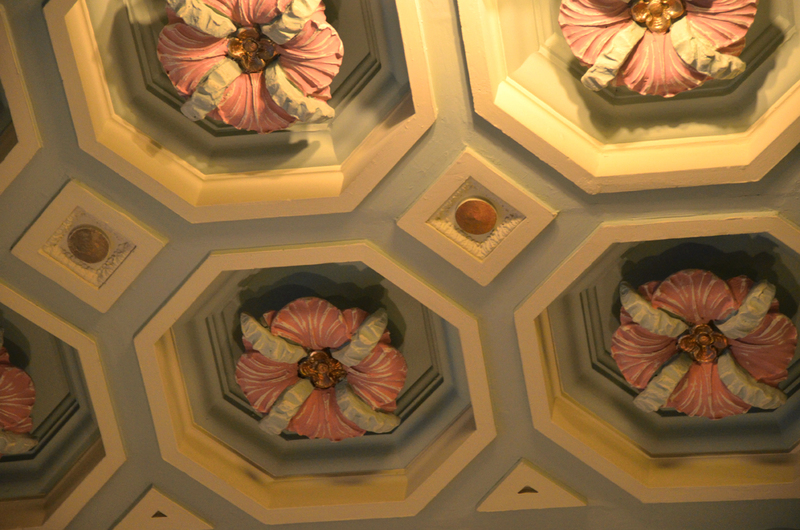 The original plaster hibiscus-pattern was restored from a small section that had been hidden above the 1970s false ceiling. It is stunning! 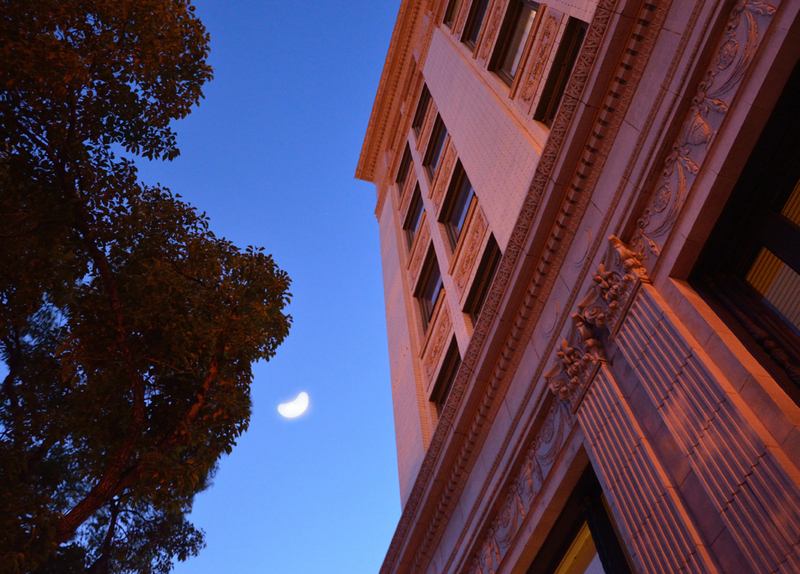 Next time you go downtown, be sure to stop by and admire one of Anaheim's historic treasures. 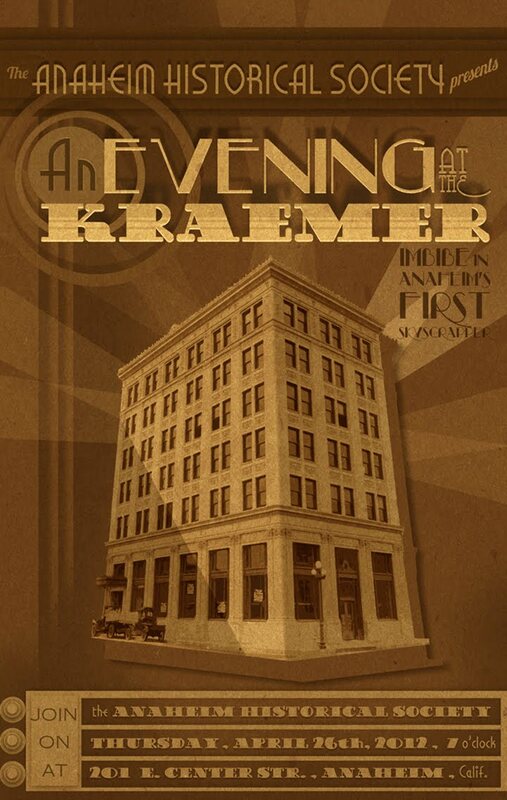 The Kraemer Building is located at 201 E. Center Street -- a block east of Anaheim Blvd. AHS artist Jody Daily has created a beautiful, limited edition print capturing the architectural romance of Anaheim's past. The image titled "An Evening at the Kraemer" is available as a deluxe art print for $25, or matted and framed on demand for $150. All sales benefit the AHS's educational and preservation efforts. Contact us at anaheimhistoricalsociety@gmail.com. We need volunteers to help us organize our AHS files in the Anaheim History Room. Our files go back to 1970, when AHS was first organized, and we need to get everything in order! Would you be willing to spend a few hours per week assisting in the organization of our files? 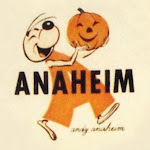 With a team in hand, we could work together to recapture the highlights and history of our own important impact on the role of AHS in Anaheim's history. It's easy and fun. 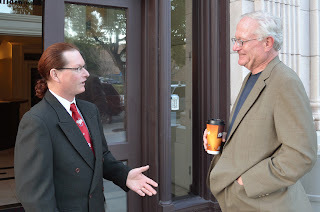 You stand at the door or in a room with a script and when visitors come through, answer any questions they may have. That's it! · Sunday May 27, 9:45 am to 12:45 pm or 12:15 to 3:15 pm. 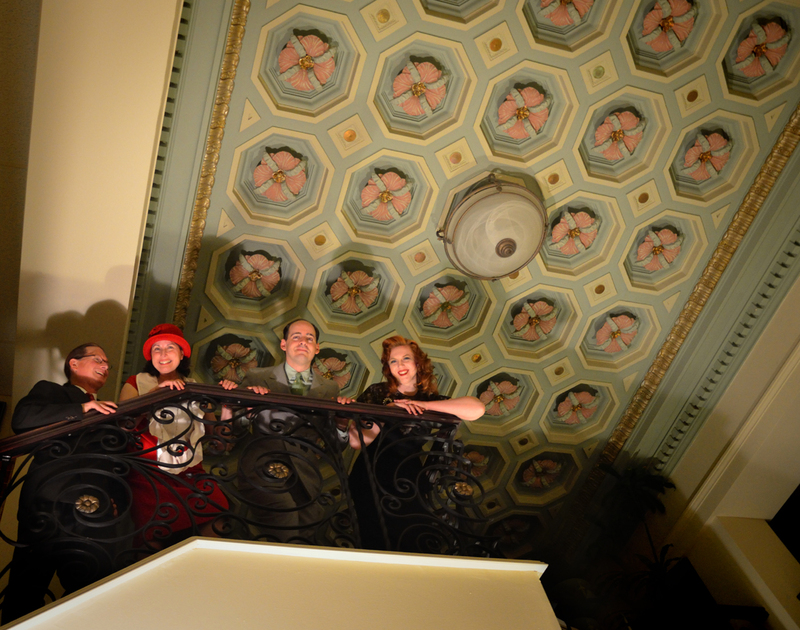 Please let us know your time preference and which house you would like to be a docent for. 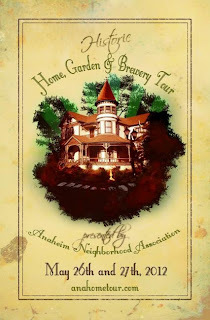 Bonus: if you volunteer to be a docent, you will receive a FREE ticket to the other places on the tour, including the Anaheim Brewery (but you'll need to buy your own beer...)! An Evening at the KRAEMER!